This strawflower has a super long-distance effect. Its large flowers distinguish it from other varieties. The green foliage offers an attractive contrast to the bright flower color. It blooms for a long time and in a large abundance. Its growth is well-branching which also makes it appealing as a large solitary plant. Even if it needs a lot of water, it is easy to clean because it does not have to be cleaned out. 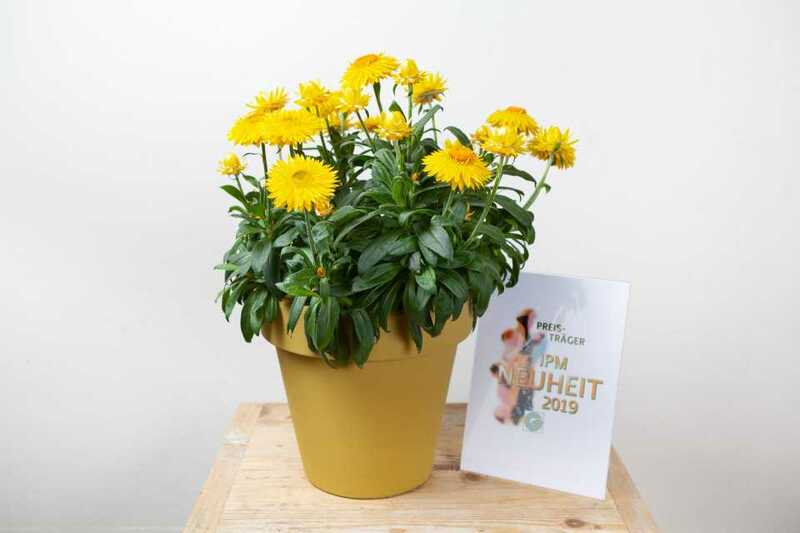 One of the highlights of the 37th IPM Essen trade fair in Essen, Germany, in January was the IPM Innovation awards, which recognize the top new varieties on display. A total of 58 innovative varieties in eight categories, submitted by 31 exhibitors, competed for the IPM Innovation 2019 prize. After evaluation by an expert commission on the eve of the fair, varieties were awarded prizes in seven of the eight categories, with one receiving the top overall prize. Check out the slideshow above for a look at this year’s winners.